Ram Nath Kovind took over as India’s 14th President on Tuesday in a ceremony marked with pomp and tradition. In acceptance speech after taking oath of office in the historical Central Hall of Parliament, Kovind underscored that the key to India’s success was its diversity. “In this land we find a mix of states and regions, religions, languages, cultures, lifestyles and much more. We are so different and yet so similar and united,” he said. The 71-year-old, who took over the highest Constitutional post in the country from Pranab Mukherjee, is the first BJP leader and the second Dalit in the Rashtrapati Bhavan. Stressing on access and opportunities for the “last person and the last girl-child from an under-privileged family”, he said, “We have achieved a lot as a nation, but the effort to do more, to do better and to do faster should be relentless. This is especially so as we approach the 75th Year of our independence in 2022.” The former Bihar governor, described variously as low profile and unassuming, said the country needs to sculpt a robust, high growth economy, an educated, ethical and shared community, and an egalitarian society, as envisioned by Mahatma Gandhi and BJP ideologue Deen Dayal Upadhyay. The change of guard had begun early in the morning with a gentle knock on the door of Kovind’s Akbar Road residence. It was military secretary to the President, Major General Anil Khosla. Khosla, who had come with a motorcade, invited Kovind and his wife Savita to the Rashtrapati Bhavan, where Mukherjee received them in the study. Hours later, the roles had reversed and President Kovind escorted Mukherjee out of the Rashtrapati Bhavan. 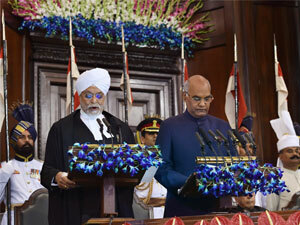 After Chief Justice JS Khehar administered the oath of office to “preserve, protect and defend the constitution and law”, Kovind exchanged seats with Mukherjee. Addressing the gathering, Kovind referred to his humble background and said he grew up in a mud house in a small village. His journey to the presidency had been a long one. “It is so telling of our nation and our society also. For all its problems, it follows that mantra given to us in the Preamble to the Constitution — of ensuring Justice, Liberty, Equality and Fraternity — and I will always continue to follow this basic mantra,” he said. Remembering his predecessors Rajendra Prasad, S Radhakrishnan, APJ Abdul Kalam and Pranab Mukherjee, Kovind said the country’s independence was the result of the efforts of thousands of freedom fighters led by Mahatma Gandhi. “These leaders did not believe in just political freedom. For them, it was crucial to also achieve economic and social freedom for millions of us,” he said. After the ceremony, Kovind met leaders across the political spectrum who had gathered in Central Hall. He then left for the President’s House in the presidential limousine —this time with Mukherjee in the left and India’s new president on the right. The skies opened up as the procession made its way to the Rashtrapati Bhavan, where the new president formally took charge.